For many of us the program recorder was the first device that we had to save programs that we had typed into the console. Compared to a disk drive system, the program recorder was much less expensive and though slow, it did a pretty good job, and was fairly reliable. Even though the TI-99/4 was released in 1979 TI didn't release it's own program recorder until early 1983. During this time we were pretty much on our own to find a cassette player that would work. There were several articles in the TI magazines of the time comparing different models, and providing lists of ones that would work and those that didn't. The best luck was to be had by choosing a quality model with a tone and volume control. The model that TI eventually released was actually produced by GE and TI rebranded it. The first ones were black, and shortly beige models were the norm. One problem that was fairly common with 3rd party recorders were that they couldn't be turned on and off using the remote jack. The 99'er magazine actually produced and sold a little gizmo called the "TI-Sette" adapter. This allowed the remote jack to work on the above mentioned recorders. A lot of software was released on cassette, and even with a disk system it is probably not a bad idea to also have a program recorder handy! The above picture shows the main controls. One very helpful feature is the counter. This allowed you to put several programs on the same tape, and you could note on the tape where each program began. The picture below shows the side view where you would hookup the supplied cable. It also shows the tone and volume controls, and also the AC connector which was used with the supplied AC cable. 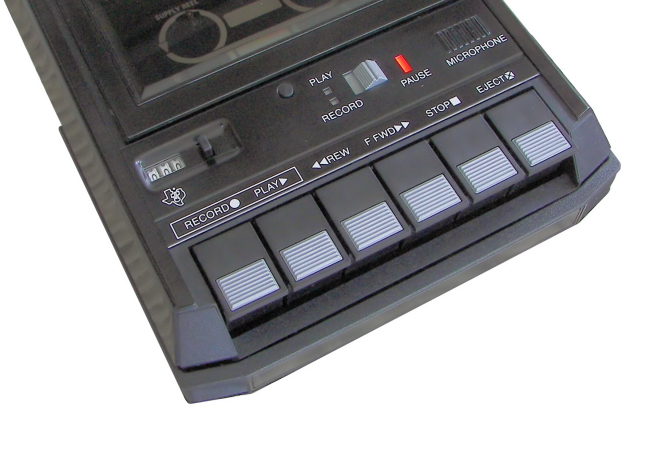 Though you could run this recorder with batteries it was not recommended since as the batteries wore down the tape player would slow down and produce unsatisfactory results. After you have connected the cables, adjust the tone and volume controls by turning them until the white marks on the wheels are centered (see picture above). Create a small program and then we will save it to the recorder. If the following appears then the data has been recorded correctly and you will not need to make any adjustments to tone or volume controls. If the data was not recorded correctly you will receive one of the two error messages below. You now may wish to adjust the volume control either a little up or a little down and try again by choosing "R" to record. If you receive the error below it means that it only had trouble reading some of the data.. you are close now, try some slight changes in the volume and try again by choosing "R" to record. You bought your TI-99/4A Home Computer because the plug-in Command Modules looked like a quick and easy way to get started. You played the games anti typed in the programs that you found in the Users Reference Guide. Now comes the moment of truth—What to do next? The answer, fellow 99’ers, is easy: Learn how to use a cassette tape recorder with your computer so that you can begin to build up a program library by recording and saving the many excellent software programs that appear printed in 99’er Magazine. In order to get started you’ll need a tape recorder cable, a cassette tape recorder, and some good quality cassette tapes. The cable assembly is specially manufactured for Use with the Tl-99/4A Home Computer (Dual Cassette Cable, PHA2000) and should be available from any TI retailer. Cables made for other computers will not work with your machine. When it comes to locating a tape recorder, the matter isn’t as straight-forward: TI does.. not manufacture a special tape recorder for use with their computer and really doesn’t recommend any one particular brand. There is a good reason for this, because finding a recorder, that provides satisfactory results is not as easy as you’d think. To explain Why, I will have to give you a quick background on how a computer talks to a tape recorder and vice versa. The first thing that you must realize is that a computer is very, very dumb! While your brain can understand things like “yes,’ “no,” and “maybe,” a computer only understands “off” and “on.” Everything, that a computer does is based on the fact that it understands only these two things. In order to do the wonderful things your computer is capable of doing, the “offs” and “ons” have to be arranged into patterns that the computer can use. This is true not only for numbers, but for letters as well. For example, if you type in the letter “A” on the keyboard, your Tl-99/4A really sees a pattern that looks like this: on-off off-off-off-off-off-on. If we think of an “off” as a zero and an “on" as a one, the pattern looks like this: 10000001. Remember that everything your TI-99/4A does is based on groups of binary numbers like that. Each 1 or 0 is called a “bit” In addition, every pattern of ones and zeros has its own binary value. Learning to count in binary is beyond the scope of this article, but there are a number of books or articles around that can teach it to you. What you should know for now is that each letter and character has its own pattern of zeros and ones and its own binary value. In order to make it easier to communicate with a computer, the bits are grouped into groups of four. Two groups of four bits is called a “byte.” A byte can contain 256 differ- ent combinations of bits (or values) and has enough combinations to allow a unique pattern for each letter, number and character on your keyboard. For example, the 65th possible pattern (a byte value = 65) represents the letter “A” in the ASCII character coding system used by the Tl-99/4A and most computers. This means that 65 is the ASCII value of the letter “A" That is why the computer will give you back an answer of 65 if you ask for the value of ASC(”A”). To make a word, the letters are strung together (just like in English). When you type in a word as part of a TI BASIC program, the computer will convert each letter in the word into a byte and make sure that this particular grouping of bytes makes sense. For example, if you type in GOTO on the keyboard, the computer will read that as 7l 79 84 79. In order to read data from a tape recorder, your computer will have to be able to read in bytes of data. That means that it will have to understand “offs” and “ons” when listening to the tape. Unfortunately, there is no such thing as an “on” or an “off” to a tape recorder. Even when it is absolutely quiet to your ears, a tape contains some amount of noise. So we can’t say that no noise = “off” and noise “on" Instead, we need another way for a tape recorder to communicate an “off” or “on” to the computer. This is done by using two tones, each at a different frequency. The lower frequency tone can then mean “off” and the higher frequency tone will mean “on." If your tape recorder cannot record or playback the higher frequency, your computer would only hear “offs"
Only these two tones are recognized by the computer. If it “hears” any other tone, your 99/4A will ignore it. Of course, TI has added some tolerance to the computer so that if it hears something almost like the “on” or “off” tone, it will accept it as an “on” or “off.” This means that for your 99/4A to properly read data from a cassette recorder, the tone must be both loud enough (i.e., the volume set high enough) to be heard and also be at the right frequency. frequency data tones that mean "off: but only hear part of the higher frequency tones that means “on” In order to help the TI-99/4A hear the high frequency tones properly, the tone control knob on the recorder should be set at or near the maximum level. Even if this is done, some tape recorders cannot handle the high frequency. If your recorder doesn’t have a tone control there’s a good chance it was probably meant to handle only the frequencies of human speech and won’t be mechanically able to handle the high frequency tone at all. Since it is possible that your recorder cannot reproduce the high frequency tones properly, your computer has to be sure that it has read all the data. How can it make sure that nothing was lost? Your computer counts the number of “ons” that it heard. After every so many bytes, it expects to read a number on the tape. This number tells the computer how many “ons” it should have read. If the two numbers don’t match, a “parity error” has occurred and the computer will tell you that you have a problem. Now suppose that the volume is set high enough to reproduce the high level tones, but is up too high? Well too much volume causes distortion in a tape recorder. This distortion will mean that some of the tones will not be heard accurately by the computer at all. It’s just like someone screamed in your ear. You know something was said, but you don’t know what it was. First—the tape recorder has to be able to handle both the high and low frequency tones and it must be capable of reproducing them within a small range of the frequency at which it was recorded. In order to record and playback the higher frequency tone it is usually necessary to have the tone control of the tape recorder set at, or near maximum. Second—the tape recorder must be capable of small volume adjustments so that you can reach a condition where the volume is loud enough to be heard by the computer and yet low enough so that there is no distortion. Third—the tape recorder must be able to record and playback the very quick shifts in frequency (from “off” to "on”) accurately so that no tone is lost when being played back into the computer. There is one additional problem that may crop up even with tape recorders that satisfy the above criteria: Almost all cassette recorders have a remote control jack which allows you to stop the recorder by pressing a button or switch located on the microphone. 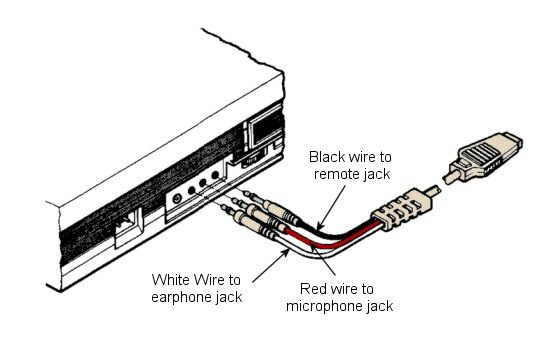 Unfortunately since this jack is meant to work with the manufacturer's own microphone, there is no guarantee that the jack is hooked up the same way in each tape recorder. In fact, there is a 50-50 chance that the tape recorder model you buy or already own will not be compatible with the system your Tl-99/4A is expecting. This means that the drive motor of your recorder might not be capable of being turned on and off automatically by the computer when the plug on the TI cable is inserted into the recorder’s control jack. Luckily, if this is true for your recorder, 99’er-ware sells an inexpensive adapter (called “TI-SETTE”) which is used between your recorder and the TI cable. If you don’t want to spend the money for this adapter, you can get by without, by manually starting and stopping the tape, except if you intend to use cassette files, in which case the auto- matic operation is necessary. The conclusion you can draw from all this is that your Tl-99/4A requires a tape recorder with specific attributes in order to consistantly guarantee good results. TI provides its owners with a list of 2-6 tape recorder models that work well with the 99/4A computer. If you do not already own a recorder, I strongly suggest that you buy one of the recommended models. If you do have a recorder, you can try it out before incurring the expense of purchasing a new one. Now that we have discussed why some recorders won’t work at all or won’t work with the remote control jack plugged in, let’s get down to business. Shut off your machine and plug the wide cable (with 9 holes in it) into the hack of your computer. The other end of the cable has two cords. One cord has three plugs attached (labeled plug #1), and the other (plug #2) has only two. The tape recorder that you connect to plug #1 will be called “CS1” by the computer. If you are lucky enough to have a second usable tape recorder, you can hook up that one to plug #2. It will he called “CS2” by the computer. Just follow the installation instructions printed on the card that came with the TI cassette cable. If your tape recorder does not have a remote control jack, just ignore the instructions to insert the black plug. Note that CS2 does not have a playback plug. You can only record on CS2. Turn up the volume on your TV (or monitor) by a few notches so that you can hear a slight hum. Set the volume control on your tape recorder mid-way between the lowest and highest settings. Set the tone control (if there is one) up to maximum. Now type in SAVE CS1 and press the ENTER button. Follow the instructions that the computer gives you to rewind the tape and begin recording. When you press “record” on your tape unit and then press the ENTER button on the computer, the tape should start moving. If the tape doesn’t start moving, you have a non-compatible remote control jack. If this is the case, wait for the computer to get out of recording mode and print the “VERIFY (Y/N)” message. When it does, type in an “N". Now remove the plug from the remote control jack and begin the recording process all over again (by typing SAVE CS1 and pressing the ENTER button). When you are told to record, you should now see the tape moving. After a short pause, you will actually hear your program being recorded onto the tape. The recording consists of an initial long phrase of a single tone, followed by bursts of sound with a very short pause between bursts. This initial tone is used to tell the computer on playback that data is coming. This tone is recorded before each program and each block of data (which we will talk about later). When the recording is over, you will get the verify message (see above). Type in a “Y” (you don’t have to press the ENTER button). Follow the instructions about rewinding the tape. When you play back the tape, listen to the sounds that it is making. Note that the volume is much louder than when you recorded. If that initial tone does not sound pure (it seems to warble with the tone going higher and lower), you are probably using a recorder that won’t work well consis- tently. If the tone does seem pure, you’re halfway home! When the tape goes silent, the program has finished loading. You should get a message that says either “DATA OK” or “ERROR IN DATA”. If no message prints, then the volume setting was too low and your computer is still waiting for the first recognizable byte of data. It will eventually get tired of waiting and give you a “NO DATA FOUND” error. Just wait for this message to appear, or shut off your computer and start all over again. If you got the “DATA OK” message, you are home fre& Relax and go on to the next paragraph. If you were unlucky enough to get a “NO DATA FOUND” error, turn up the volume one notch. If you got the “ERROR IN DATA” message, you probably had the volume too high. Lower the volume one notch. Write down the latest notch on a piece of paper. In either case, respond to the computer question by entering an R to re-record. The computer will guide you in another recording session. Keep repeating the process until you can’t change the volume any further, or the “DATA OK” message appears, or the error message has changed (i.e., from “NO DATA FOUND” to “ERROR IN DATA”). If you can’t change the volume any further, your recorder just isn’t good enough. Don’t aggravate yourself, any longer, go out and buy one from the list. If the DATA OK message has appeared you are in good shape. If the message has changed, back off your last change by half a notch. For example, if moving the control from 6 to 7 made the “ERROR IN DATA” message appear, try the recording process again at 6 1/2. If that doesn’t work, try it at 1/4 notch intervals. If that doesn’t work, forget it. Buy a different recorder. After you get the “DATA OK” message, mark the volume setting in some way. I usually dip a toothpick in white paint (a light nail polish will also work) and dab a line on both the recorder and the control so that I can easily see that the volume setting is correct. You now have a functioning cassette tape system and are ready for bigger and better things! When you entered the SAVE CS1 command, you told the computer to copy the bytes that represented your program inside the computer onto a tape. The entire program is saved each time. Your program is still in the computer, however. If you agree to verify your tape, TI BASIC will read in the tape and compare it in a byte-for-byte manner with the program still residing in memory. Unless the two match perfectly, your 99/4A will issue a warning that you have a bad tape. ALWAYS VERIFY ANY SAVEs BEFORE ENDING A PROGRAMMING SESSION! The tape version of the program is saved in a “machine image" format that is meaningful only to TI BASIC. You cannot, however, write a Tl BASIC program that will read this tape. The only way to get your program back into the 99/4A is via the OLD CS1 command. This will load the program back into the machine. Anything that may have been in the computer before the OLD CS1 will be lost. By the way, you can SAVE CS2 (if you have a recorder hooked up to cable #2) and then read in the tape by entering OLD CS1. Of course, you have to move the tape over to the recorder attached to cable #1 first! The instructions built into the TI-99/4A whenever you enter the SAVE CS1 or OLD CS1 command assume that you have only one program per side of tape. In reality, you can save more than one program per side. A long program will require about 3-4 minutes of recording time. This means that it is possible to save about 4-5 programs on each side of a C-30 tape. If your recorder has a tape counter, just keep track of where the next free space on the tape is located. Then, when the computer tells you to rewind the tape, just fast-forward to that next free spot on the tape instead. Just make sure to keep a log of what programs are recorded on a tape and where they are located. If you don’t want to be bothered by this, and want maximum, reliability, it is better to use C-10 cassettes and record only one program per side. A cassette tape recorder will usually have the ability to record a new program directly over an old one. It is good to get into the habit of completely erasing a tape, however, when you no longer need it. This ensures the best possible recording the next time you use the tape. The cassette recorder also makes a handy data storage device for use in your computer programs. Suppose that you have written a program to keep track of the bowling scores and figure out the handicap of each member of your bowling league. You don’t want to re-enter this information each time you run your program. What you need is a way of saving the data when you are through with it so that it can be read in the next time around. Some people do this by coding in the information in DATA statements each time before SAVEing the program. A better way of doing this is to write out a small “file” of data onto a tape. Your program can then read in this data the next time it runs. TI BASIC has an easy way of doing this by using the INPUT # and PRINT # statements. Before you can read or create a file, you must tell the computer a little about your file. This is done by the OPEN statement. Your reference manual does a pretty good job of explaining this statement, so I’ll just go over the parts specifically dealing with cassette tape files. Unlike the SAVE command which writes out your entire program as a large “chunk” of data, BASIC data files can only handle small chunks of data, called “records,” at a time. Each file can contain 1 or more records. All cassette records in a file must be of the same size. They can all be 64 bytes (characters) long, 128 bytes long, or they can all be 192 bytes long. You can specify other lengths as part of the OPEN statement, but TI BASIC will boost the number up to either 64, 128 or 192. If a record you want to write is shorter than the length that you specify, TI BASIC will add enough blanks at the end of the record to make it the right length. Each record can contain as much data as you can fit in that size record. When you have a statement that says PRINT # and ends with a semi-colon, BASIC will add that data to the record, but will not write anything out to the tape. When BASIC sees a statement with PRINT # that doesn’t end with a semi-colon, it will write out everything in a record (including this last piece of data) to the tape. When the record is written to tape, it is preceeded by the same steady high-pitch tone that starts off a SAVE. That means that BASIC uses a lot of tape to write a single record. In fact, if you use records that are only 64 bytes long, it is possible that more room is spent on the tape for the start tone then is used to record the data! Remember that more room on the tape means slower reading by the computer. That’s why I usually use 192 byte records and try to fit as much data as possible into each record. Doing this will cut down on the number of records written to tape, and make the program run faster. 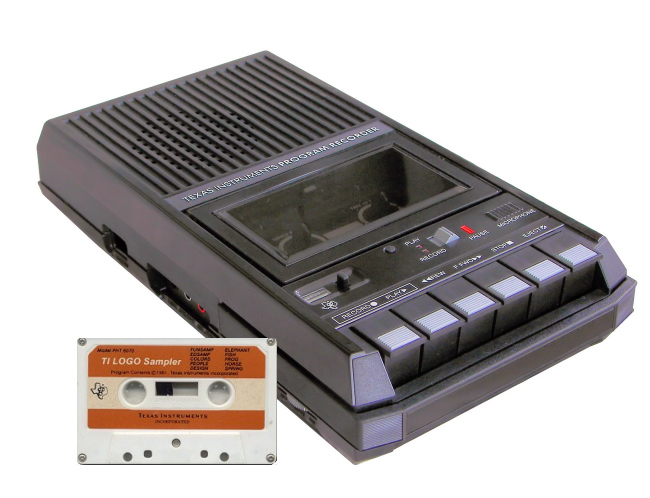 Since TI BASIC only writes to tape when you tell it to, the computer must have total control of the cassette recorder so that it can start and stop the recorder as needed. This means that the black remote-control plug must be in- serted (and functional!). If your remote jack is notcompatible with the Tl-99/4A, you will not be able to use the recorder for saving and reading data under program control. This is where the TI-SETTE Adaptor, listed at the end of this article, can help. You can store in two different formats. DISPLAY format means the data is saved just the way it would look in a DATA statement. INTERNAL format saves the data in the same way that the computer stores the information internally. Numbers require 8 characters (bytes). Strings (i.e., names) require 1 byte (for the length) plus the data itself. I usually save my data in INTERNAL format so that I know the length needed for numbers no matter how big or small they are. Let’s write a part of a program that will save each bowler’s name, his pin average and his handicap. Pretend that we have 60 bowlers in our league. If we restrict each bowler’s name to a maximum of 47 characters, we will need a total of 64 bytes per bowler (47 bytes + 1 48 for the name + 8 for the average + 8 for the handicap 64). We can therefore fit the data for 3 bowlers into one 192 byte record. 1090 REM ADD TO RECORD AND WRITE IT OUT! If you have filled up a record by the time the program hits the CLOSE statement, TI BASIC will fill the record with blanks and write it out. You do not have to worry about writing out a last record that is partially full. Just remember to always code in a CLOSE statement. To read the data file into your program, you need code that almost duplicates the write code. Note that statement 300 reads in the last piece of the record and tell TI BASIC to read in a new tape record the next time it sees a READ #1 statement. When your program hits the OPEN statements, it will issue commands about rewinding the tape and pressing ENTER. Just before it reads the first record, the screen will scroll up one line to indicate that it has begun processing the tape. I have often been asked why TI provides the CS2 plug. I have to admit that most manufacturers do not provide dual cassette support. It is useful if you must process more data in your program than the computer can handle inside its memory. You would need two recorders hooked up, and would read in as much data as possible (for example, as file #1) on CS1, then do whatever you have to, and finally write the updated data out on CS2 (as a different file number). You would then go back and read in the next batch of data from CS1, update it, and write it out. You repeat this until there is no more data on CS1. This allows a small computer to handle very large files. At this point you should have the basic knowledge for choosing a cassette recorder, and getting it to work with your computer. Keep in mind that tape storage transforms your Home Computer into a very powerful and versatile machine. And once you get familiar with the few simple procedures and precautions, each occasion of saving and loading programs and data files will become second nature, one might even say, “filled with memories . ."